Backing up to January 6, though, let's talk FASHION! 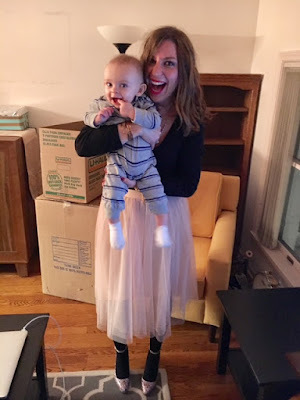 I wore this tutu (yasssss, girl!) on my 30th birthday that was just so whimsical and fun! Here are some snaps from the eve-- again, my apologies for everything being fuzzy iPhone camera quality. I do have a photoshoot on the books for next weekend! (This weekend I'm chaperoning Operation Snowball for our school-- did you ever do that retreat in HS? It's going to be so fun!). It was very special to have my old teaching pals out to celebrate my birthday at Penrose! We can't wait to spoil Kelly's future baby boy very soon! Glitter pumps: here. They are currently down to $100! I got mine for free! (Well, sort of haha!). My sweet MIL got me a gift card to J. Crew for Christmas, and I had another return, so my glitter pumps were FREE! FINN! Anna, Shawn and Finn (and Coop) spent the night on my birthday. It was the highlight of the birthday week to have my family out in Geneva! My darling former student, Brittany, was Finn's babysitter for the eve so Anna and Shawn could join us at the brewery. SO. Much. FUN! I just wish I had some more pictures! haha! This is one of the 5 photos I have from my birthday party, and it makes me smile so big. Gotta fluff the tulle! hahaha! Candid shot of Jenny Lynn and Kel! The beauty of this fun skirt is that I just needed a plain black shirt and black tights. Done and done. Add in Sarah! We missed Mandy so much! Can't wait for all six of us to be together next weekend! Aerial shot of the shoes! Jenny's adorable Toms wedges shined brightly! 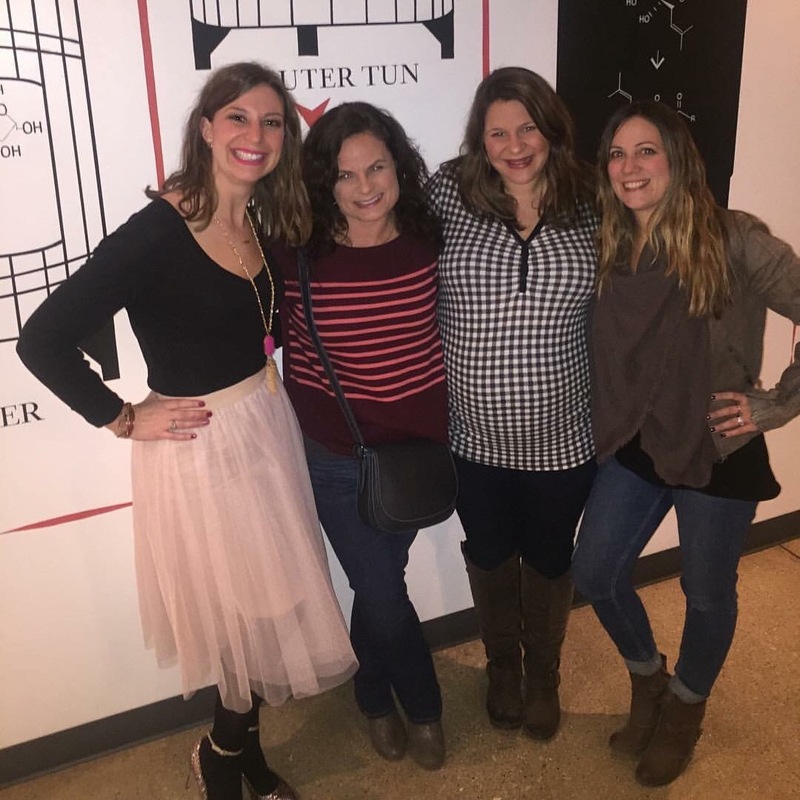 Totally excited that my barre belle, Taryn, and her husband could make it out, too! How cute is her choker shirt? The best part about these pumps is that they are both comfortable and practical (LOL). Practical in the sense that they are coated, so the glitter isn't loose. Two of my favorite males, ever!! In matching Patagonia puffers. We couldn't have done it without our amazing lawyer, Mary, and incredible realtor, Val. Please let me know if you're in the market to buy in the Chicagoland suburbs. I will get you in touch with our crew! Gettin' comfy at the island. We arrived in our new home to this surprise. Val was absolutely fabulous in every way. I couldn't believe my eyes! PS: my friend, Jena, made the sign! I can get you the scoop on those, too! HOW IS EVERYONE? I am so happy to be back!